Schweizerische Industrie Gesellschaft (SIG) is a Swiss company, now known as Swiss Arms. In 1975, SIG entered into an agreement with German gun manufacturer J.P. Sauer & Sohn to develop and market a new handgun which became the P220. The P220 was the first SIG Sauer handgun sold in the US. It was marketed initially by Browning as the Browning BDA. The SIG Sauer P220 is a refinement of the Petter-Browning design used in the SIG P210. The locked breech design is very different and was pioneered by SIG Sauer. See also The first SIG Sauer Handgun. The P226 was designed for entry into the XM9 Service Pistol Trials (see also Joint Service Small Arms Program) that were held by the US Army in 1984 on behalf of the US armed forces to find a replacement for the M1911A1 and 24 other makes of handgun in US military service. Only the Beretta 92SBF and the SIG P226 satisfactorily completed the trials. According to a GAO report, Beretta was awarded the M9 contract for the 92F due to a lower total package price. The P226 cost less per pistol than the 92F, but SIG's package price with magazines and spare parts was higher than Beretta's. The Navy SEALs, however, later chose to adopt the P226 as the P226 MK25 with special corrosion protection. For the U.S. military XM9 trials, the P226 was imported by Saco Defense. Interarms took over importing when the pistol was introduced for civilian sales. SIG Sauer eventually founded SIGARMS, Inc. (now SIG Sauer) in the United States to handle importation of their products. In 2000, SIG Holding AG sold J.P. Sauer & Sohn GmbH to two German businessmen. The brand name SIG Sauer remained at J.P. Sauer & Sohn GmbH. SIG Sauer firearms are manufactured in Eckernförde, Germany by Sig Sauer, GMBH and in Newington, NH, United States by SIG Sauer Inc., (formerly SIGARMS Inc.) Both of these companies along with Swiss Arms AG, Mauser Jagdwaffen GmbH, J.P. Sauer & Sohn, John Rigby & Company, German Sport Guns GmbH and Blaser Jagdwaffen Gmbh are subsidiaries of Luke and Ortmeier Gruppe of Emsdetten, Germany. Copies of the P226 are produced in China by Norinco, under the name of NP226. The ZOAF is made in Iran as the standard pistol of the Iranian military. Copies of P226 are produced by Myanmar for Tatmadaw, under the name of MA5 MK III. From a distance, the P228 can be differentiated from the P226 by comparing the trigger guards (the P228's is curved, while the P226's is slightly hooked) and the barrel and slide lengths (the P228's barrel 99 mm (3.9 in), thus having a corresponding shorter slide). Also in a side-by-side comparison the P228 would appear slightly shorter (15 mm (0.59 in) shorter) than the P226. The larger capacity P226 magazine can also be employed in the P228 although it extends from the base of the grip. Civilian sales of the P228 were discontinued with the introduction of 9mm chambering in the P229 but were recently reintroduced in limited quantities to civilians with an accessory rail and hooked trigger guard, designated the P228R. The P229 is nearly identical to the P228, however its slide is made from milled stainless steel (versus the P228's folded carbon steel slide) and is available in 9mm, .40 S&W, and .357 SIG. In the summer of 2012, SIG Sauer announced they were releasing the M11A1, which is essentially the milled-slide P229 chambered in 9mm with P228-labeled grips, a short reset trigger, SIGLITE tritium night sights, Mec-Gar 15-round magazines, and a military style smart tag and serial number. Later in 2012, Air Force M11b versions of the P228 were released for civilian sale. The M11 is to be replaced in the Army and Air Force through the Modular Handgun System program. On January 19, 2017, it was announced that the SIG Sauer P320 Compact (M18) had been selected to replace the M11 as the U.S's service pistol. One factor in winning the Modular Handgun System competition was the ability to employ 9mm Parabellum, .357 Sig or .40 S&W cartridges within the same basic frame. The P229 can be chambered in .22 LR, 9mm, .40 S&W or .357 SIG. Changing between .40 S&W and .357 SIG is as simple as switching out the barrel; both calibers use the same magazine. Conversion barrels also allow a P229 or P226 to change between a .40 S&W/.357 SIG to a 9mm caliber. The 9mm model (both railed and non-railed) can be converted to .22 LR, but in the past its receivers were not designed to provide the space needed for handling the larger rounds of .357 SIG and .40 S&W. As SIG Sauer has slowly begun adopting the E2-style grip system across the P229 model range in 2011—a move similar to what is also happening to the larger P226—they have also begun using the .357 SIG/.40 S&W spec frame dimensions for their factory 9mm P229s, presumably to streamline the number of variations in parts needed to be kept in inventory. Although the manufacturer has announced that older-configuration magazines will continue to operate in the new receiver configuration, SIG Sauer has nonetheless revised new P229 9mm factory magazines to a design that is specific to the resized magazine well of the newly reconfigured receiver/frame. As a consequence, the newer magazines are not back-compatible, due to their larger width. ^ a b c "Products & Services - SIG SAUER (P226)". SIG Sauer. Archived from the original on 2010-04-10. Retrieved 2011-02-28. ^ a b c d e f g h i Valpolini, Paolo (June 2009). "There are Two Types of Men in this World..." (PDF). Armada International. Archived from the original (PDF) on 2010-02-14. Retrieved 2010-02-13. ^ "Beretta Success in winning the XM9 competition". ^ "Army Rangers - Weapons - Guns - Gear - Spec Ops - SOFREP". ^ "Sauer: Intro". Sigsauer.de. Retrieved 2011-10-23. ^ "Sensation: Lüke Group takes over majority shares at GSG". All 4 Shooters.com. Retrieved 13 January 2018. ^ a b "MA5 MK II: The Burmese Tatmadaw's Production Glock Handgun". thefirearmblog.com. 2018-07-23. Retrieved 2018-07-29. ^ "Sigarms donates $100,000 to foundation". Shooting Industry. 2005. Archived from the original on 2008-01-11. ^ "SIG Sauer P226 E2 Review". gunsholstersandgear.com. ^ a b c "Modern Firearms article on P228/P229". World.guns.ru. 2011-01-24. Archived from the original on 2010-09-14. Retrieved 2011-10-23. ^ a b "P229". Products and Services. SIG Sauer. Archived from the original on 2007-10-12. Retrieved 2010-12-17. ^ Wiley Clapp (2011-03-09). ".357 Sig|Shooting Illustrated". Shooting Illustrated. Retrieved 2012-05-14. ^ a b "Bangladesh Army". Retrieved 2011-01-09. ^ Scarlata, Paul (1 September 2009). "Military: police handgun cartridges of Canada". The Free Library. Retrieved 2010-12-17. ^ "Missing Police Firearm". Vancouver Police Department. May 24, 2012. Retrieved May 24, 2012. ^ "襄阳特警配发拐弯枪等一批高精尖装备(图)" (in Chinese). 2016-08-19. ^ "GIGN.ORG » PISTOLETS". Retrieved 24 November 2014. ^ "ECTLO - Escouade de Contre Terrorisme et de Libération d'otages". Archived from the original on 8 December 2015. Retrieved 24 November 2014. ^ "Armament of the Georgian Army". 9 March 2012. Archived from the original on 9 March 2012. 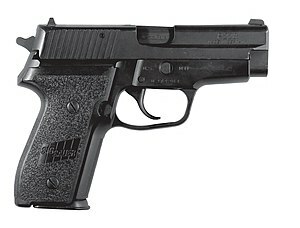 ^ "P226". Dienstwaffen.di.funpic.de. Archived from the original on 2013-11-03. Retrieved 2011-08-06. ^ "Greece Ministry of Public Order Press Office: Special Anti-Terrorist Unit" (PDF). Official Website of the Hellenic Police. July 2004. Archived from the original (PDF) on 2009-11-08. Retrieved 2009-10-13. ^ Milosevic, Milan (2005). "Trojanski Konj za Teroriste" (in Serbian). Kalibar. Retrieved 2009-04-04. ^ a b "Kopassus & Kopaska - Specijalne Postrojbe Republike Indonezije" (in Croatian). Hrvatski Vojnik Magazine. Archived from the original on 2010-08-22. Retrieved 2010-06-12. ^ "ZOAF 9 mm pistol (Iran), PISTOLS". Jane's Information Group. 2003-06-02. Retrieved 2009-05-31. ^ Janq Designs. "Special Operations.Com". Special Operations.Com. Archived from the original on 2011-08-20. Retrieved 2011-08-06. ^ "The Aftermath — Post-Mortem, Forensic and Ballistic Examination". Retrieved 2009-05-03. ^ "isayeret.com". Archived from the original on 2016-01-06. ^ 海上自衛隊 特殊部隊 解説 (in Japanese). Archived from the original on 2012-11-29. Retrieved 2012-11-28. ^ a b Thompson, Leroy (December 2008). "Malaysian Special Forces". Special Weapons. Retrieved 2010-02-08. ^ "Royal Netherlands Marine Corps, Dutch core Expeditionary Force". Dutch Defence Press. 2001-01-04. Retrieved 2011-08-06. ^ "Personal Weapons of the NZ Army". Archived from the original on 2009-12-18. ^ "Intrade Asia Pacific - About Us". ^ Sebastian Miernik. "Strona poświęcona Wojskowej Formacji Specjalnej GROM". Grom.mil.pl. Archived from the original on 2011-08-14. Retrieved 2011-08-06. ^ "exercito.pt" (PDF). Archived from the original (PDF) on 2011-08-09. Retrieved 2011-10-23. ^ "cyberpioneer - Features - Small & deadly (Mar 11)". Mindef.gov.sg. Archived from the original on 2012-08-05. Retrieved 2011-08-06. ^ "Web Del Grupo Especial De Operaciones (GEO)" (in Spanish). Official Website of the Spanish National Police Corps. Archived from the original on 2011-05-20. Retrieved 2009-06-26. ^ "Stockholm County Police - A presentation" (PDF). Archived from the original (PDF) on 2011-09-28. Retrieved 2011-08-06. ^ "อาวุธประจำกาย และอาวุธธประจำกายทหารราบ" [Body armor and weapons for the infantry]. Thai Army (in Thai). Retrieved 2019-03-24. ^ "Sualtı Taarruz Komutanlığı". Özel Kuvvetler (in Turkish). 29 October 2011. Retrieved 10 January 2015. ^ "Ministry of Defence Police, Freedom of Information Response" (PDF). UK Government. 2 Feb 2016. Retrieved 25 Dec 2017. ^ a b c "P229 DAK". Products and Services. SIG Sauer. Archived from the original on 2013-11-02. Retrieved 2010-12-17. ^ "LE/Military Overview". Sigsauer.com. Archived from the original on 2011-08-07. Retrieved 2011-08-06. ^ Frank, Thomas; Hall, Mimi; Levin, Alan (2005-12-08). "Air marshals in spotlight". USA Today. Retrieved 2010-05-23. ^ "About Us : News". Sigsauer.com. Archived from the original on 2011-07-26. Retrieved 2011-08-06. ^ "Police Service". VA Nebraska-Western Iowa Health Care System. U.S. Department of Veterans Affairs. Archived from the original on 2014-09-10. ^ "A Stability Police Force for the United States: Justification and Options for Creating U.S. Capabilities" (PDF). RAND Research Corporation. 2009. Retrieved 2010-04-05. ^ "Americancopmagazine.com". Archived from the original on December 6, 2010. ^ "Texas Ranger Hall of Fame and Museum - Texas Rangers Today - Standard Issue Equipment". 2009. Archived from the original on 3 June 2012. Retrieved 29 May 2012. ^ "NYPD Training Manual". Archived from the original on 2010-07-14. ^ "Sig Sauer P229: The handgun that protects the President—and you!". January 2013. ^ a b "SIG Sauer P226 Product Details". Archived from the original on 2013-08-23. Retrieved 2013-05-22. ^ "ORLANDO POLICE DEPARTMENT POLICY AND PROCEDURE 1702.1, FIREARMS AND POLICE IDENTIFICATIONl" (PDF). ^ "MPD Academy". Archived from the original on 2010-05-03. ^ "Shelby County Sheriff's Office". ^ Division of Criminal Justice. "CSAO: Report on the Death of Robert Phelps". Ct.gov. Retrieved 2011-08-06. ^ "Franklin County Sheriff's Office Selects SIG SAUER P226 as Standard Issue Pistol". Sig Sauer. Retrieved 2019-03-21. ^ Calamur, Krishnadev (November 25, 2014). "Ferguson Documents: The Physical Evidence". NPR. Retrieved 4 December 2014. ^ "New Jersey State Police Academy". Njsp.org. 2006-07-19. Retrieved 2011-08-06. ^ "Houston Police Department Recruiting: What kind of pistols?". Hpdblog.com. 2010-10-13. Retrieved 2011-08-06. ^ "cityofsacramento.org" (PDF). Archived from the original (PDF) on 2011-09-26. Retrieved 2011-10-23. ^ "Bayview Shooting: Explaining the Discrepancy Between SFPD Guns and Bullet Found in Kenneth Harding". KQED News. Archived from the original on 2 November 2013. Retrieved 24 November 2014. ^ "Tampa PD Tactical Response Team". Archived from the original on 2013-03-09. Wikimedia Commons has media related to SIG-Sauer P226, SIG-Sauer P228 and SIG-Sauer P229.